Hi, Good Morning, Thank you friends and viewers. 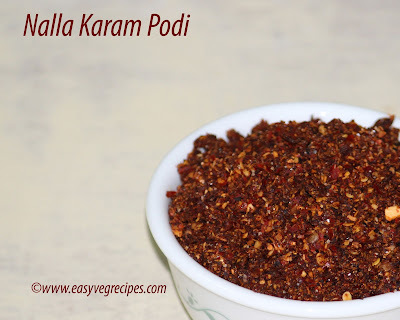 Today I will post how to make nalla karam podi recipe. Nalla Karam podi or powder is the best accompaniment for idli, dosa and also to hot piping rice. It is very spicy powder. I am very fond of the powders served in restaurants when we order idli/dosa. They look very tempting. I always wanted to try those powders but never get them as spicy as they were served in hotels. Once when we had a kitty in Susila's house, she served it. I liked it very much and it was exactly the same taste as it is served in restaurants. I took this recipe from her. She makes it in traditional stone mortar and pestle. Yeah, making it in that is very difficult but tastes awesome. If we do not have mortar and pestle at home we can make it using a blender, but we need to do a little portion at a time. If we do all at one go, we get semi powder. As the moisture in garlic and tamarind makes it wet. Do not reduce the number of red chilies as it should be spicy, then only it tastes good. Heat oil in a kadai, fry red chillies till they turn dark brown shade. Keep them aside. In the same kadai, add coriander seeds, black gram, cumin seeds and fenugreek seeds. Fry them till they turn light brown. Keep them aside. Again heat the same kadai and add tamarind to it. Fry for two minutes or till it turns stiff. Allow all of them to cool or come to room temparature. Remove the skin of garlic cloves. In a blender jar combine coriander seeds, black gram, fenugreek seeds and red chillies. Blend them to make coarse powder. Add tamarind and again grind it to make powder. Add salt and grind it. Lastly, add garlic cloves also to it and grind it to powder. If you want to mince it in mortar and pestle, first make coarse powder of all the ingredients except salt and garlic in a mixer jar. It eases the work. Then add this to mortar and using a wooden pestle mince till it turns into a powder. Mincing in mortar and pestle needs lot of patience and energy. spread this powder in a wide plate to cool. Store it in an airtight container. Serve nalla karam podi with hot piping rice, idli or dosa with dollop of ghee. Thank you for visiting my blog. Hope you liked all my recipes. Any feedback and comments are appreciated. For more chutneys and powders click here.